Small group tours begin at the Big Blue Bear, Denver's favorite piece of public art. We include stops at a few of the following Denver locations: Lower Downtown (LoDo), Denver Highlands, Colorado Convention Center, Coors Field, Denver Union Station, Denver City and County Building, Colorado State Capitol, Molly Brown House, Governor's Mansion, Cheesman Park, Capitol Hill Mansion Bed and Breakfast, Denver Country Club's Reed Castle, Cherry Creek North, Denver Art Museum, City Park, Denver Museum of Nature and Science. Each tour is conducted a little bit differently and we can't go to every spot listed above so the guide will pick several. Some groups like the guide to emphasize architectural features and styles. Others like the oversized public art. We will ride carefully as a group to each stop, pull up safely on the sidewalk, and then spend two-to-ten minutes talking about the interesting aspects. The group will mostly ride on side streets, but occasionally be on a multi-lane road. Your guide will adjust to the riding ability of the group, so the number of stops will vary. Along the way, your guide will tell stories about Denver's history beginning in 1858 and continuing through the trends of this modern city. Denver's early characters are brought to life and conversation will be had about architecture, city planning, property disputes, and the undead. (This tour is actually very light on the haunted malarkey). The group usually visits various pieces of public art, private art, graffiti mural art, and things that are so outlandish that they must be art. The guided tour portion will be at least 90 minutes but our intent is to be out two hours. The group will go to as many places as fit comfortably. Before leaving, the group will have a significant amount of time dedicated to teaching each person how to ride the scooters safely and how to ride in a group, so plan to dedicate 3 hours total. 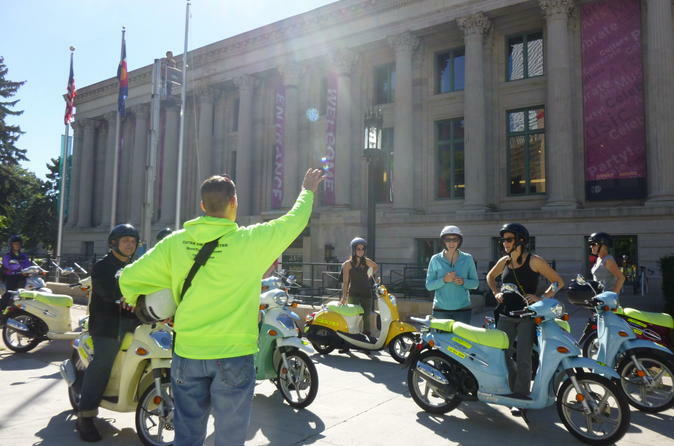 After the tour, many people do not want to stop the most fun part of their visit to Denver, so they continue on their scooters for the rest of the day and explore by themselves (by special arrangement, extra charge applies). There are no stops for food or water during the tour so feel free to bring a water bottle. Most of the time, the group doesn't need to stop for a bathroom break either, but will if necessary.